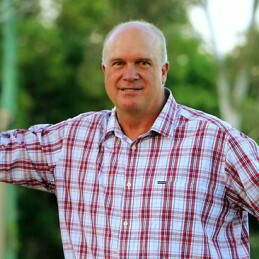 Carl Rackemann was born and raised on his family’s farm near Kingaroy in Queensland. His sporting talents were first recognised in high school when he was selected to play for the Queensland under-19 team. After finishing school, Carl moved to Brisbane to fast track his career. He made his first-class debut against Western Australia in 1979/80 and would make his Test debut in 1982/83 against England at the Gabba. Carl’s best year was the 1994/95 season at age 34. He would be the highest wicket taker in the Sheffield Shield competition with 52, at an average of 23.39, prompting the Australian selectors to pick him as the replacement for injured Craig McDermott on the tour of the West Indies. He finished his career with 39 wickets from 12 Test matches, at an average of 29.15, and 82 wickets in 52 one-day internationals, at 22.35. In 102 Shield games, his 383 wickets, at an average of 26.31, is third highest in Sheffield Shield history. Following his retirement, Carl remained close to the game, commentating radio and television broadcasts and writing a column in the Sunday Mail. Carl has also stayed involved with Queensland Cricket and run his own coaching camp in the school holidays for aspiring children.